← Indiana Jones…what a letdown. Just finished Portal, an original puzzle game that came with the Half Life Orange Box. It was amazing, read about it here. 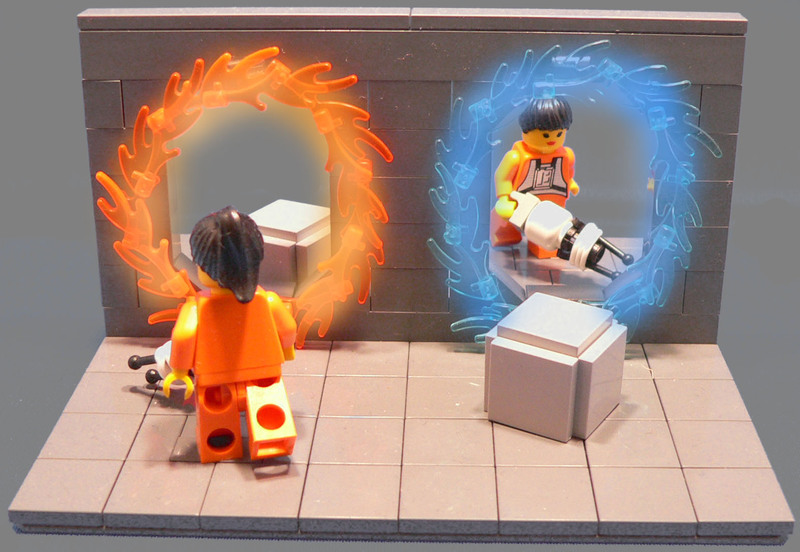 I was even more impressed to find this Lego picture when I whacked Portal into Google Images. I also enjoyed playing about on this artist’s website. Can’t wait for There Will Be Blood to come out on DVD. It’s definitely one of my favourite films. Apparently, Jonny Greenwood, who composed the score of the film, was ineligible for an Oscar as he had used some of the music in his other works. I did recognise some of the songs from his album Bodysong. However, he also used music from a piece called Popcorn Superhet Receiver. You can listen to the whole piece here, which is part of a Radio 3 recording that includes an interview with Jonny himself. Talking of films, I’m thoroughly looking forward to the Kubrick season on Channel 4; check out the promo video below (Thanks to Leo). They recreated the set in as much detail as possible and used actors who looked like the original cast/crew. The season begins on the 15th of July with a documentary about the director. PS Head here to watch the first six minutes of the new Batman film. This entry was posted in Film, Games. Bookmark the permalink.